On the sidelines of the Africa Investment Forum, the African Development Bank and Africa50 have signed an agreement with the Democratic Republic of Congo and the Republic of Congo to develop and finance the first road-rail bridge project linking their capitals - Kinshasa and Brazzaville. "Upgrading the infrastructure of the Republic of Congo is one of our foremost priorities, in particularly transport, which can help us diversify our economy through increased trade and investment. ", said Jean-Jacques Bouya, Minister of Large Construction Works of the Republic of Congo. "The positive socio-economic impacts from this project will be significant, stimulating trade and economic growth and creating jobs in the Republic of Congo and beyond". Modeste Bahati Lukwebo, Senior Minister of Planning of the Democratic Republic of Congo, added that, "The construction of this bridge will not only link to the cities, but will speed up regional integration beyond our borders. The Democratic Republic of Congo is proud to be a partner in this effort, which aligns with our vision to modernize basic infrastructure. We look forward to working with Africa50, the African Development Bank and the Economic Community of Central African States". The President of the African Development Bank, Akinwumi Adesina said "The idea to connect the two capitals dates back to the mid-19th century. This project is just the beginning, more will follow." Pierre Guislain, Vice-president: Private Sector, Infrastructure and Industrialisation of the African Development Bank added "This project is an example of what the Africa Investment Forum is about: creating partnerships between African institutions and, the private sector for transformative projects." 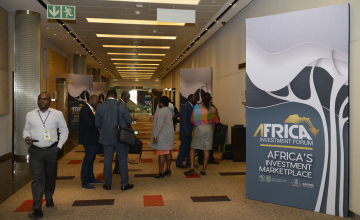 Alain Ebobisse, CEO of Africa50 said, "Straddling two borders, this project presents unique and complex structuring and development challenges, requiring a robust, detailed PPP framework. This is where our expertise in project development can make a difference. With the guidance of the Democratic Republic of Congo and the Republic of Congo; and the support of the African Development Bank and the CEEAC, we are convinced that this transformative project can materialize in a few years."